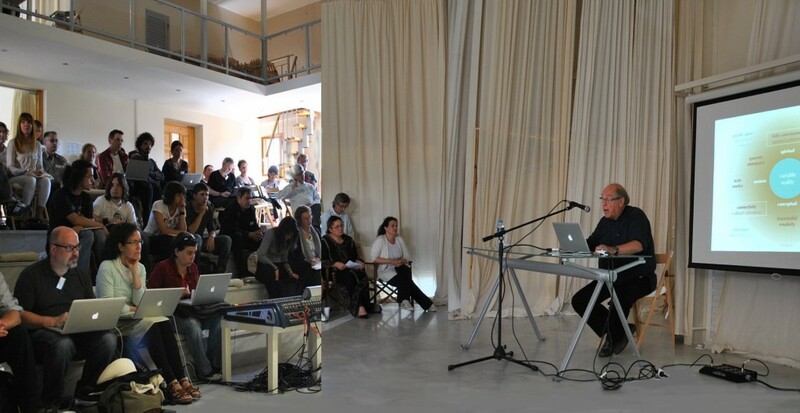 The Center as Institution with Global and innovative network and vision (https://www.ionionartscenter.gr/2016/01/18/international-program/), attracts and attends the high standard creative and academic requirements of prestigious artists, scientists and researchers from all over the World. A number of significant Schools, Colleges, Universities, in Arts, Sciences and Research involved Institutions and Organizations are beneficiaries of its administrative and academic support . The Center through its activities, academic programs and international network is offering:cutting edge educational, scientific, cultural standards, using innovative ways and technologies for teaching, creating and promoting Arts. Acknowledges models, social and philosophical systems and theories of the past, while by exploiting up -to -date scientific paths investigates, defines, registers meanings, represents and reports the realities and the images forming the Contemporary World. The academic activity of the Planetary Collegium, Plymouth University in the Center was the starting point for an outstanding academic program . The I-Node(http://www.i-node.org)since 2012 officially established the academic sector of the Center as an integral part of the Planetary Collegium, under the academic supervision of Prof.Roy Ascott,its founding President . The next steps led the Center in permanent collaborations with world leading Academics and Universities. The advanced academic research runs under the accredited programs of UTS, University of Technology Sydney, GSU,Georgia State University, NCSU, North Carolina State University, Gaulladet University W.D.C. LIST OF ACADEMICS -RESEARCHERS -ARTISTS WHO’S ACADEMIC PROGRAM WAS OR IS CONNECTED TO THE IONION CENTER. Anker Kathrine – Elizabeth ( writer, a cultural theorist and an independent researcher). Bianchi Amos( Coordinator of postgraduate programmes at Nuova Accademia di Belle Arti Milano (NABA, www.naba.it). Capucci Pier Luigi( Supervisor, M-Node, Planetary Collegium, University of Plymouth,. Faculty member, NABA Academy of Arts and Design). Cetkovic Aleksandar ( multidisciplinary architect and computer scientist). Derr Diane ( Faculty member, Virginia Commonwealth University /Quatar University). Didakis Stavros( Media Arts Technology ,Institute of Digital Arts Technology (i-DAT), University of Plymouth). Earhart Blanka (Cultural producer based in Los Angeles, CA). Caraceni Simona ( Museum Informatics at the University of Bologna). Kouros Panos (Artist and art theoretician, Associate Professor at the Department of Architecture, University of Patras). Lancaster Linus (Art teacher/art director at Healdsburg Unified School District in Northern California). Ljubec Živa (Faculty for Mathematics and Physics, both at the University of Ljubljana). Monico Fransesco (Supervisor, M-Node, Planetary Collegium, University of Plymouth). Pandilovski Melentie ( Director of the Video Pool Media Arts Centre in Winnipeg, Manitoba, Canada). Zamanzadeh Nasim (Independent researcher and designer). POSTER EXHIBITION / RESEARCH UPDATES /PLANETARY COLLEGIUM /UNIVERSITY of PLYMOUTH. I-NODE /PLANETARY COLLEGIUM ‘’MULTIMEDIA DATABASE AS NARATIVE MECHANISM’’(in collaboration with the University of Thessaly, department of Architecture. Collaborative Project on Art Training and Design 2015- 2016-2017. All disciplines are included : Visual Arts, Performing Arts and Music, Literary Arts, New Technologies, Research and Sciences as Archaeology, Anthropology, History, Art History, Classic Studies, Art Preservation – Restoration, Protection of the Natural Environment and Cultural Heritage. A special interest is given in the fields of Classic Greek Studies, Art, Poetry, Literature and Philosophy and their effect to the contemporary World and Art.